Perhaps it would be a good idea to find out what people were already buying and investing their time in. I started asking people for their shopper dockets and collecting my own. And so was born my new book Shopping News, 10 years in the making and released in May by Melbourne’s Australian Scholarly Publishing. The driving idea seemed simple enough: to find out what people want to buy and can afford, and see whether this knowledge holds any secrets for us in journalism. I found out one or two more things along the way. So how does this work? 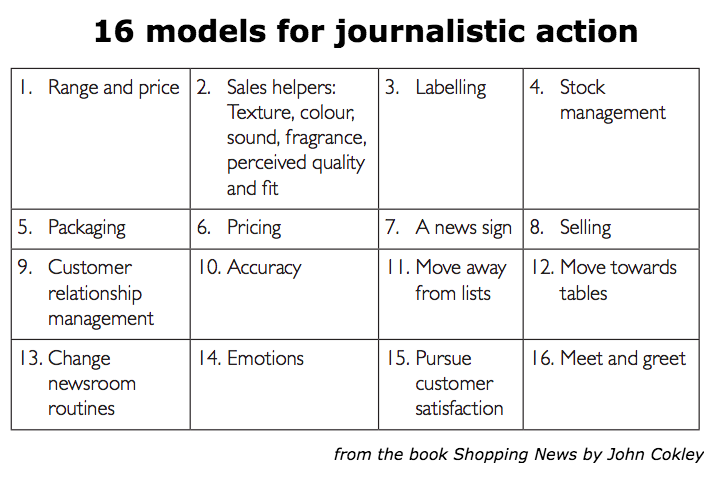 Having looked at and visited shops all over the world and studied how I and others bought items and services for 10 years, I arrived at 16 models of how successful selling in shops might be applied to our work in journalism. Here are the 16 models. There is no ‘theoretical magic’ in the number 16: it’s just the number I ended up with. In the process of developing these 16 models, I realised that I had developed two particular methods to get to my model, methods I called Agenda-Finding: specifically The Shopping News Kitchen Table™ and the Audience Soundtrack Analyser™. Both looked at how to identify what any particular audience was thinking about before I published my news bulletin, so I could make sure my news was on their wavelength. This doesn’t mean I manufactured news to suit my audience but it does mean I made sure the news I had to offer was presented in a way which appealed to my audience. Of the 16 models, Range & Price and Labelling are the easiest to put into action. How are products displayed on shelves in most shops? By range and price. Similar items are grouped together to make choosing easier and everything is marked with a price. The range of items for sale in a ‘news shop’ can be easily worked out by looking at the table of contents (sometimes called the ‘index’) of a newspaper, or at the navigation bar along the top or down the side of a website. Impartiality in most newspapers and websites would be about 45%-55%, the typical ratio of editorial articles to paid advertisements. Independence in most newsrooms would be about 20%, the ratio of stories sourced by a newsroom’s own reporters to the stories imported from wire services and suggested by corporate or government media releases. 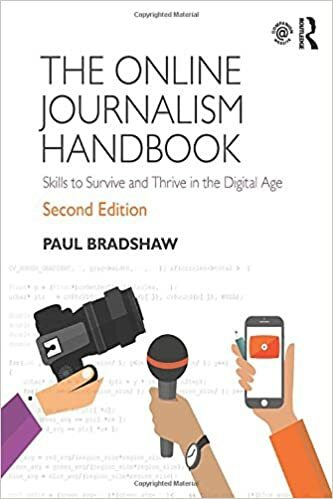 Fairness would be calculated using the software based on the number and kinds of sources interviewed, the amount of those interviews which made it into each story, and the point of view or ‘valence’ of each interviewee or source used in each story. An originality index (‘who broke the story first?’) might be the easiest of the lot to organize since Google News and Google Trends already provide similar data. A little work with a psychologist should come up with a feasible index for surprise/delight and entertainment. The ability of a news organisation to analyse events accurately can be measured really easily using the newsroom’s own database of published stories and comparing predictions with outcomes to arrive at an Analysis Accuracy Index (another percentage). Using the same software we could produce an Accuracy Index. Better still, companies such as iSentia already collect and analyse a whole range of factors in news publications, and News Corporation’s Dow Jones and Factiva data-mine hundreds of publications worldwide, allowing researchers like me to see and analyse trends and sources in stories and extrapolate to measure influence. Award-winning excellence is surprisingly easy to calculate. Every publication keeps a register of major awards won by its staffers and it’s easy to verify too. Finally comes value for money. Is it possible to claim ‘value for money’ in journalism? Wait … someone’s already done something similar: a Value for Money Index already exists for fitness clubs. This VFM Index combines three factors which its developers say show ‘how much value a member is gaining from their membership: How often the member is visiting, the level of service a member is receiving (measured by recording service interactions) and how much the member is paying’. 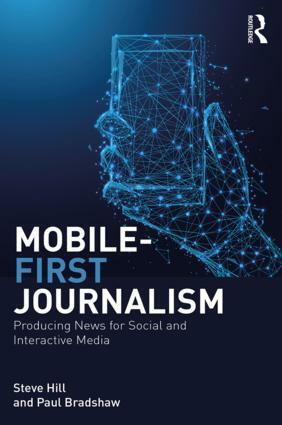 News organisations (among many others) already collect this data, often provided by third-party analysts such as Alexa and others using Google Analytics. 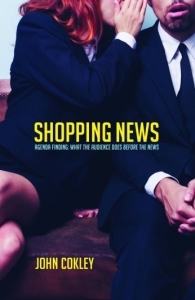 In the prologue of Shopping News I suggest we picture journalism as the provider of solutions for identifiable real-world problems experienced by individuals and communities, in the same way that science, engineering and manufacturing seeks to provide solutions to real-world problems. This would demystify journalism products in various markets and allow us to cost them out and price them appropriately for each market. In effect it would provide the first cost-benefit analysis of journalism. Speed, accuracy, the ability to take notes, the ability to write in inverted-pyramid style or to meet a deadline … what real world problems do these solve for individuals and groups in any community? Understanding shopping concepts like ‘customer orientation’ and ‘customer satisfaction’ and putting it into practice will help move journalism towards being a profession which provides something meaningful to its audiences. Journalism can then become a profession that satisfies everyday needs, expectations and desires, not just a profession which satisfies itself.